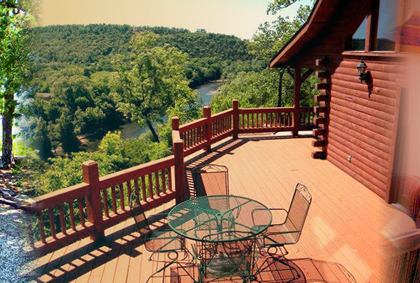 River Ridge Inn is located on the banks of the North Fork of the White River in Norfork, Arkansas. The North Fork River is truly one of the most heralded trout fishing tailwaters in the world. For those of you looking to make your first acquaintance to the area, you are in for a most exciting and relaxing time. At River Ridge Inn, we have succeeded in providing you with an atmosphere that compliments the rigors of fishing with a relaxing environment having all the comforts of home. The Cottages and Chalets come fully equipped with all necessary kitchen utensils, bedding and abundance of towels and toiletries. All are stocked with coffee, teas, spring water, juice, sodas, snack foods and sundry items. The main lodge offers individual room accommodations as well as a sauna, exercise facilities and hot tub. The Chalets were built in 2005-6 and provide unimpeded views of the river from the oversized decks. The fronts of the Chalets are nearly all glass, making it seem as though you are alone in the wooded areas along the North Fork River. It's no wonder that these CHALETS are the most sought after places to stay on the River.